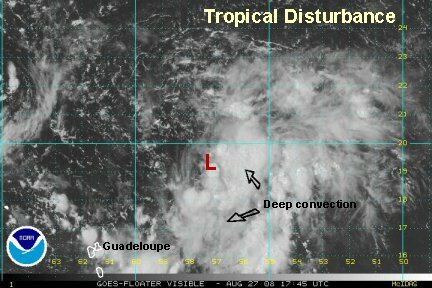 A disturbance centered a little over 1000 miles southeast of Bermuda or about 250 miles northeast of the Leeward Islands is becoming better organized today. The surface low is mostly void of convection, but showers and storms have increased markedly on the southern flank southwestward to the Leewards. At this time it appears that this could become a tropical depression in the next 1-2 days and be pulled northwest ahead of a trough. 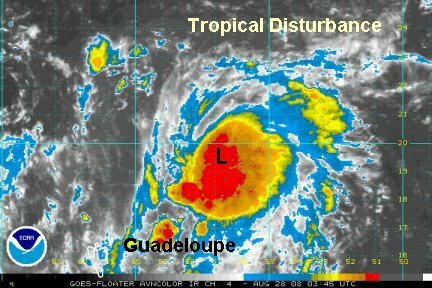 Interests in Bermuda should keep track of this tropical disturbance. Last edited by Caribbean Traveler on Thu Sep 04, 2008 1:52 pm, edited 4 times in total. 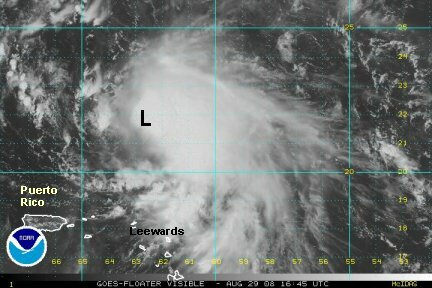 This "tropical disturbance" is centered about 1000 miles southeast of Bermuda and about 250 miles northeast of the Leewards. Quickscat satellite shows that a surface has formed and deep convection has built over the center of circulation. The forecast models keep this one east of the U.S. mainland. Interests in Bermuda should keep an eye on it. NHC upgraded tropical depression 8 to tropical storm Hanna at 11 am edt. The circulation center is on the northwest side the the cloud mass. This is an indication that is is fighting westerly shear from the upper low west of it north of the Islands. This is the same upper low than hampered Gustv with northerly winds a couple of days ago. This wind shear is very problematic.....right now the shear is winning and stripping the convection from the center. At this point, not knowing what effect the wind shear may have several days down the road, may be the most reasonable solution. We will be watching the satellite imagery closely! By the way, if Hanna were to head into the direction of Florida, it would be reminiscent of David and Frederick in 1979. Frederick went into the Gulf and David on the east coast of Florida. This is just a very general comparison, Hanna is approaching from a different direction and has not threatened Florida at this point. 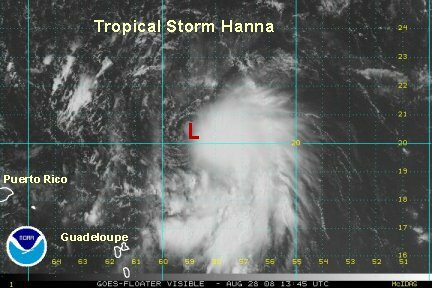 The westerly wind surge around the upper low to the west eased and the convection built back around the center of circulation of Hanna. More recently the winds have increased again and threaten to push the convection back to the east of the center. At this time, Hanna still has numerous showers and storms on its eastern side. This is going to be a complicated forecast. Hanna, will be fighting wind shear from the upper low to the west. The low is predicted to move west, but models disagree how far. If it stays close, wind shear can still effect Hanna, causing the low level wind flow to carry it more westnorthwest. 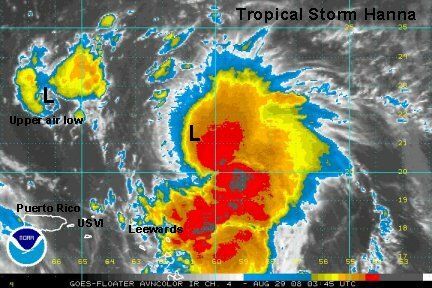 It the upper low pulls away, Hanna strengthens into a hurricane and is governed by a higher wind flow. Either way, a front (and upper trough) will approach Hanna in a few days. It looks like it will turn it some northwest then lift out. This will allow Hanna to stall some east of the Bahamas. After that a high pressure ridge builds back in sending it southwestward. Some models crash it into the northern coast of Cuba, another into the Florida straits and......into the southern Gulf. That Is a wild forecast and I wouldn't get worried about that happening yet. There are way too many question marks at this point. For the Leewards... the tail end of the unsettled weather continues to near Antigua and Barbuda and Anguilla. Showers could be heavy at times with gusty winds. The structure and appearance of Hanna has not changed considerably since the early afternoon update. Excellent outflow is still apparent on the eastern side of the storm. 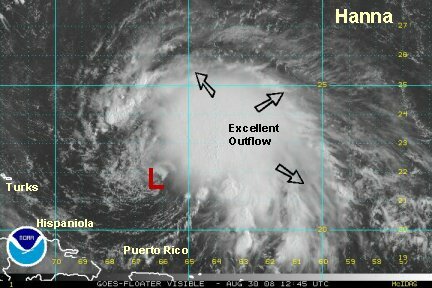 The upper air low is still holding on west of it and producing just enough shear so that Hanna doesn't organize rapidly like we are seeing now with Gustav. The forecast that we have been talking about is still around. The Euro model now has it moving to near Miami then into the Gulf and eventually to near the western Florida panhandle. Again, we can't emphasize enough, that no one should panic on this scenario. Track errors can be large, especially several days out. For this scenario to play out the models build a small mid level high over Bermuda, this sends it west southwest toward the Bahamas. After that, a large high over the Ohio Valley takes over sending it toward the Florida straits. As the high moves east, Hanna would be directed around the high toward the northern Gulf. A couple of our favorite models have this type of forecast unfolding. The rest of the "spaghetti chart" models take it southwest toward Cuba and spread out in all directions. Another model is coming in soon. We'll give a quick report later. It's also important to note that Hanna has to survive the wind shear for this forecast scenario to play out too. The latest models continue to take Hanna on the course described in our previous update. It looks to move through the Bahamas around Monday night or Tuesday down toward the northwest Cuba coast by the middle of next week. After that back into the eastern Gulf. As a reminder, this is a long way out. Do not panic at this forecast. We are just relaying the scenarios that are being painted by the computer models at this time. Hanna appears slightly better organized this morning. The surface low looks more organized, although still on the edge of the convection. The track to the Bahamas is still on course. 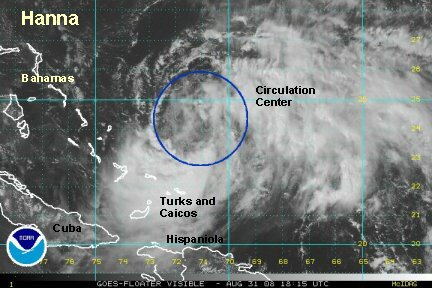 Hanna should stall north of Cuba. The time that the turn back to the north starts remains in question. Of our favorite models, one still has the Florida straits then eastern Gulf scenario. The other goes north off of the east coast of Florida to make landfall on the Georgia coast. (last night was the South Carolina coast). It's obvious that the models are jumping around, so don't take too much out of this yet. They may have the general idea of stalling it north of Cuba then moving northward at some point with a landfall. Next round of wind shear takes over. In a turn of events, Hannna's surface low is now very distinguishable. 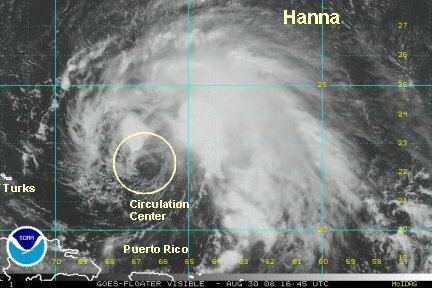 The upper low to the west has sent southwesterly winds over Hanna and has now really exposed the center of circulation. The deepest convection now remains on the northeast side of the storm. The forecast models from midday, show Hanna stalling in the Bahamas then moving north inland in South Carolina late in the week. As we mentioned before, this track has definitely moved around, especially after day 3. The southeast from Florida to North Carolina needs to pay close attention to the track. 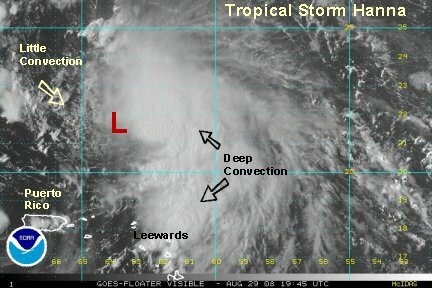 We'll, Hanna has merged with the upper low to the west. That has resulted in what NHC very appropriately said "looks now more like a subtropical storm". The surface center in now building convection under the upper low. This likely will be the center that takes over and becomes tropical again as it stalls east of the Bahamas. NHC's official track is starting to reflect the model solution that we have been discussing recently. It looks like Hanna stalls in or east of the Bahamas then moves northwest toward the Southeast U.S. coast and makes landfall by late next week. The landfall locations have been changing around. Tonight, it's eastern North Carolina. Recently, South Carolina, Georgia and eastern Florida have been targets. So, the models don't have the exact location nailed down yet. NHC says (as we did earlier) " this is a low confidence forecast at this point". 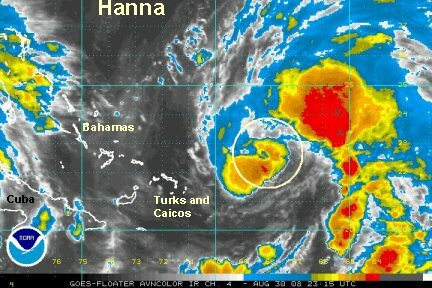 If you live on the Southeast coastal areas keep and eye on Hanna. Hanna does not look tropical at this point. We do expect it to become tropical again, after sitting east of the Bahamas for about three days. Hanna's forecast is starting to become more consistent. It stalls east of the Bahamas, then starts moving northwest by around mid week. By around Friday it may make landfall in South or North Carolina. Remember, forecasts 4-5 days out can have large errors. Hanna was increased to 60 mph. We're not sure why. The transformation process that is going on is going to take a while to settle. A squall band is heading for the Turks and Caicos around the circulation center. We expect Hanna to become tropical again and make a run at strengthening. After stalling for about three days it should move northwest. The models have had several runs now with a landfall in the Carolina's about Friday. Remember this is still several days out and could change. 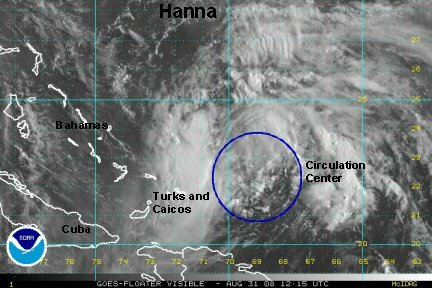 On the last advisory we were wondering why NHC had Hanna pumped up to 60 mph. Since then, a recon finally flew into Hanna. After the recon report, they downgraded the wind to 45 mph. 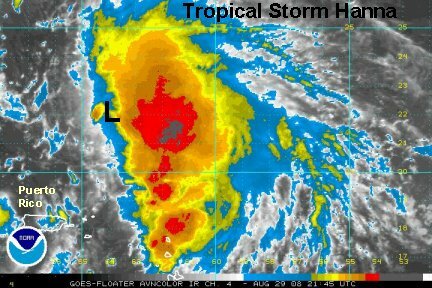 Hanna is still disorganized, but should have a slow steady transformation into a tropical system over the next 2-3 days. NHC now makes this a hurricane. The models are still consistent with taking it up to the South/North Carolina coast by late Thursday or Friday. A sooner landfall the farther south. Interests from the Florida 1st coast to the Outer Banks of North Carolina should follow the progress of Hanna.